I came into physical therapy being in so much pain I could not walk. I have flat feet which caused me to sit out of my favorite sport, Volleyball. After 3 weeks of being here I can play Volleyball and do normal things with no pain. Amy is the BEST! Before I came to Diamond, I couldn’t even walk room to room in my house without severe pain. I was in an immobilizing boot for 3 months with no relief before starting therapy on my plantar fascia tear. Within the first week, working with Amy and Andrea, I felt improvement. They have helped me strengthen my ankle and get back to my regular activities. I wish I would have come in SOONER! 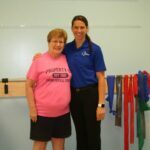 My PT experience has been awesome! Before coming to Diamond PT I was constantly in an ankle brace. Now I have hope for the future with knowing stretches and exercises to perform that will alleviate pain and strengthen muscles to support my bad ankle. I brought my 14 year old son to Diamond PT to rehab after a football injury left him with a fractured growth plate in his left ankle. 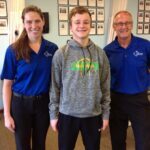 Amy and Brad gave him the necessary treatment and equipped him with many useful tools to allow him to return to his incredibly active lifestyle and many sporting teams pain free! They were both always patient and respectful yet tough when he needed it. When I first came here to Diamond Physical Therapy, my knees hurt and so did my feet. 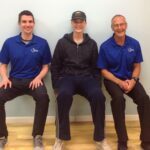 Mike and Brad helped me strengthen my legs and how to stretch my legs. After 3 months I am pain free and excited to start tennis and do activities without pain. Thank you to Mike and Brad for helping me get back to normal! I came to Diamond Therapy for pain in my left knee and foot. It was very hard walking, getting in and out of the car, find a comfortable position for the leg when driving, or do any activities. Thanks to Amy and Cindy, I’m back to my old self! I came to physical therapy with a locked right ankle, revisiting from a 30 years old hairline leg fracture and multiple torn ligaments on the outside of the ankle. Amy and Cindy have worked with me and have significantly increased the range of motion in my ankle. My strides are significantly less “toe out” as is my ankle when sitting in a recliner. Many of the activities stretched my Achilles tendons in ways I have not experienced since wearing Earth Shoes in the 1970’s. All of these activities have greatly reduced the background pain coming from the ankle. I had lots of pain in the bottom of my foot when walking. That has diminished to almost nothing. My calf and thigh muscles have been stretched and therefore help me with everything I do. Even my hamstrings are better and I feel that it has helped my back pain too. The staff here is fabulous and my two therapists were wonderful. I would recommend this place to anyone. I am very pleased. 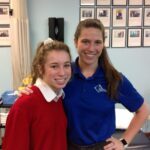 This is my second time at Diamond Physical Therapy and both experiences were wonderful! This session worked on my feet – due to tendonitis. I got to work with Alecia and Andrea – both of whom are amazing, professional, knowledgeable and caring! They encouraged me at Diamond, but were also supportive of things done at home. Successful therapy involves the therapists, the exercises and the patient. Thank you Diamond!